So much has happened in the past week, it feels like we came back from China a month ago! Thank you for praying for our family as we traveled down to China to help with the first two Character Family Seminars to be held in Mainland China. For the past several years, the Character First! team in China has been working with a handful of businesses and corporations to implement principles of good character in the workplace. Rather than starting off in as many companies as they could, Peter and the team wisely choose to work with a smaller number of businesses, but with a greater degree of involvement in each one. Touring a couple of these companies, I was impressed with first-hand reports of the difference that the character focus has made in the workplace. One company had gone from many work-related accidents requiring compensation to twenty-four months without a single accident. Another told us that after implementing Character First!, they saw such a change in their company that the leadership in their United States office also decided to adopt the program. Traveling from Ulaanbaatar to Shanghai, I remember walking out to our vehicle thinking, “It is amazing to be in China -without feeling any jet lag!” Traveling from America to meet us in Shanghai, Mr. Fahrenbruck didn’t get this advantage, but he still did a great job of leading the main sessions for the Family Seminars. Meeting in Peter’s home on one of the first days, we had the opportunity to spend some time with the Character First! China staff. There is not much that I want to say here, but they really have a special team! After some fellowship time and introductions, we talked over the logistics and details of the Character Family Seminar. After doing so many things in Mongolia with little or no preparation, I had a real appreciation for the planning that Peter and the others had put into the seminars. My brother David led the Children’s Seminar, assisted by the rest of my siblings, while I shared some sessions for the teenagers. A number of local families also joined Peter and the Character First! 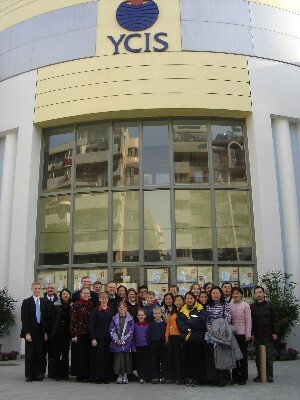 team, so overall, we had about 20 staff to help as nearly a hundred families came to attend the Shanghai seminar. Understanding that our life will often communicate a far greater message than anything we say, I decided to use a lot of personal illustrations as I taught the teenager sessions on the topics of praising family members for character, and making appeals. The Lord answered prayer in giving the students a real interest as I shared about Isaac’s life and example, my own experiences of standing alone at my first job, and other personal examples. Visiting the parent’s session, I watched as after learning how to praise for character, husbands and wives praised one another for demonstrations of specific character qualities. I felt tears welling up in my eyes as I watched a wife, perhaps for the first time, praising her husband for the character that she had observed in his life. Although I could not understand the Chinese, the joy on her face as she looked up to her husband with tears running down her cheeks was a picture that I will not soon forget. Towards the end of the seminar, my Dad was invited to speak for a few minutes on how we have worked to build character as a family. Although our family of eleven was in some ways a contrast to the one child policy in China, the simple truths that my Dad shared seemed to resonate in the hearts of the parents. After my Dad finished sharing, he asked if I could come up and share a few words. With a joy and boldness that only the Lord can give, I shared about the importance of the choices we had made as a family. We still have many things to learn, but as I look back on the life of my twin brother Isaac, I know that the choices to build character as a family are choices that we will never regret. After the session a couple guys came up and started talking with Dad and I. They said that they really appreciated what we had shared, and after some more conversation we learned that they were also Christians. Although we had been very careful not to use religious terms, they had sensed a deeper message in our lives, and wanted to know more about what we were doing in China and Mongolia. We saw God’s hand working in so many details of our trip. One example was in the teenager session that we did in Beijing. Of the 15 or so students that came that morning, a few of them did not know English, so they were grateful for Jenny’s translation. In the afternoon session, however, all of the students understood my English. Without needing time for translation, I was able to share in much more detail the material that I was covering. What none of us realized was that a couple hours later, Jenny would be needed to translate for the final sessions of the seminar. Looking back, we could not have planned it better. I was able to cover much more material with the teenagers, and Jenny was able to have a little rest so that she could be ready for the additional translation work. In between the planning and seminars, Peter had arranged for our family to do some sight-seeing in Shanghai and Beijing. 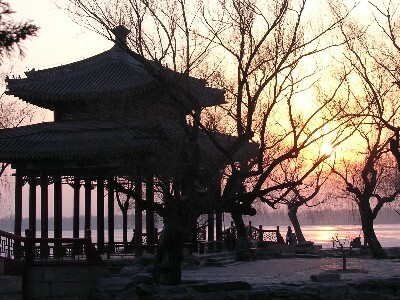 This was our first opportunity to spend a little time in China, and I found things to be such a contrast to Mongolia. A city with a population of three million, -the entire population of Mongolia, wouldn’t even show up on most maps of China! Visiting a Carrefour store, it felt like we were walking through a four story Wal-Mart! I could hardly believe the vast array of things for sale. The food section alone was bigger than most grocery stores. You could buy live frogs, turtles and eels, and just about anything else you could ever want. I remember watching a lady walking through one of the isles, placing various household items in her cart. I wonder how many people go through life, buying all the material possessions that they could ever want, but lacking in the basics of family relationships. Material possessions often portray a mirage of happiness, but behind this illusion lies the wreckage of millions of lives, destroyed by the love of money. There is a true joy that can only come from right relationships. First, a right relationship to God through Jesus Christ, and then having strong relationships with our family, and those around us. All of our things are just going to burn up one day, but the ways that our life has touched others can bring fruit that is eternal. Right now I believe that Mongolia is in a very important stage. A time when individuals and families are making the choice to pursue the things of this world, or to embrace the ideals of character. Enjoying new freedoms, people are faced with new choices. Do I spend my money on drink, or to buy food for my family. Do I study for my exams, or watch movies with my friends? I believe that God is doing some special things in Mongolia, and I believe that the Character Training Institute has been a little part of this plan in turning people to righteousness. All around us we see an increasing interest in character training. When we got back from China, Tim told us that while we were away, more requests continued to come in almost daily for us to do character trainings for schools, businesses and organizations. We have arranged our schedules to try to help with as many things as we can, but we still cannot keep up with the requests. On Tuesday a journalist came, asking if we could do a one hour interview with Channel 5, one of the most popular channels here. She was a former coworker with Khishgee, who works for WindFM, where we do a weekly call-in character program. I normally do not jump to volunteer for these kinds of things 🙂 , but when God clearly brings an opportunity to make His ways known, may I not shrink back from proclaiming His truth to the nations. In myself I have nothing to offer, but in His Word, God has given us timeless principles and truths that bring joy and peace to those that follow His ways. It is God that has made us able ministers, and it is His grace that empowers us. At church we are also seeing great things taking place. Last Sunday our pastor introduced the district leaders, mostly young men under thirty, but with a dedication to God that puts to shame most of our American youth groups. We also heard testimonies from several that publicly asked forgiveness for offending others, and another lady shared an incredible testimony of God’s provision for a financial need as she took steps to apply God’s ways to her life. We continue to hear exciting reports from the weekly cell group meetings, as the Mongolians learn and apply Biblical principles in finance and other areas of life. Our friend Ganbaa was going to share a testimony about clearing his conscience and asking forgiveness for stealing, but there were so many other testimonies that he didn’t get the chance. Back on the home front, Ganbaa, the crippled boy that we took in after finding him shivering in our stairwell with frozen ears when it was predicted that night to reach a temperature of -50F. Now rooming with one of our Mongolian staff, Ganbaa is taking great strides in Spiritual growth and character development. Amidst the amazing advances that we are seeing around us, we also see very real challenges that remind us of our daily need for God’s grace. You might remember the Morely family, a missionary family that runs an orphanage on the outskirts of the city. (Derrick brought a western saddle from America for them when we returned to Mongolia in January.) They were recently facing some difficulties with the local authorities in getting their new building inspected, but never anticipated the fiery trial that they would face a few days later. On Sunday morning Tim and Angie received a call from the Morelys and we learned that on Saturday night their house had caught fire. The guard was awakened by neighbors at midnight, and called for help from the fire department. Arriving in record time, the firemen worked with the badly leaking hoses in -22F weather to battle the fire that was blazing through the roof. Mr. Morely and others worked to drag furniture and personal items from the fire, using all the available fire extinguishers in an attempt to slow the fire’s advance as the truck drove back to the city to refill the water tank. Five hours later the fire was finally out, but the entire roof and part of the house was destroyed. The weary firemen were covered with ice from the leaking hoses, and had to drag start the fire truck before they left. On Sunday afternoon we bought some food and drove out to visit the Morelys. As we looked over the charred remains of the fire, something caught my eye. 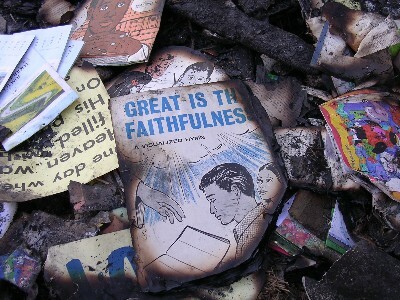 There on the top of a pile of rubble and burned books, I could still see the large words on the title of a songbook “Great is Thy Faithfulness”. What a neat picture of the hope and confidence that we have as Christians! Even when we are staring at the charred ashes of our circumstances, we have the confidence in the promises and faithfulness of God in working all things together for good. As the Mongolian guard told us a little later, the important thing is that no one was hurt. A house can be rebuilt. I was very encouraged to see the faith of the Morelys as they trust God through this situation. It was not that long ago that Mr. Morely was standing by my side in the death of my twin brother. What a wonderful picture of the love of God’s people as we hold up each other’s arms, and encourage each other to an ever deepening trust in our Faithful God. Thank you so much for your prayers for our family while we were in China! We had a very full, but very special time with the Character First! China team. A good friend of ours traveled several hours to meet us in Shanghai, and we had many other special visits with like-minded people in China. My parents were able to take a few days away last weekend for Mom’s birthday. It was a blessing for them to have some time to catch up on rest, and to have a little break from the responsibilities here. A specific answer to prayer from my last update is that we were able to locate a programmable phone for our new phone system. We found a good used one, which was far less expensive than a new unit. This week we began a weekly training schedule with the Batbaigal bakery staff. Baigalmaa came to know Christ a couple years ago after a character training, and her husband Bat has also recently believed. I am really excited about the potential of working with their company in the weeks to come. Pray that the Lord would use the character trainings to make a real difference in the lives of their workers. Yesterday Erin, Cindy and I went to the Channel 5 TV studio to tape a one hour program that is scheduled to be aired this Sunday. I was able to share about Isaac’s life and example of character. Pray that the Lord would give wisdom to the engineers as they put together the program, and that it would touch the hearts of many people. On Monday of next week we have the early registration deadline for the English and Russian Basic Seminar planned for early April. Pray that many English and Russian speaking Christians would be able to come and hear practical truths from the Word of God. We are very grateful for the phone system that the Lord provided through some friends in Minnesota. A few days ago we were able to the phone lines connected into our phone system. The good news is that it is now in operation, but the bad news is that in the initial setup, some unforeseen power loading issues with the battery backup may have caused some internal damage to the unit. Pray that the Lord would give wisdom in getting this repaired next week. Please pray for continued grace and strength for the Morely family after the fire. They have been a testimony of God’s grace through this time, but I know that there are many decisions that have to be made and projects that will require extra time and resources. first Character Family Seminar in China. On our final day, we spent the afternoon at the Great Wall. You can see several more pictures on our website at the link below. 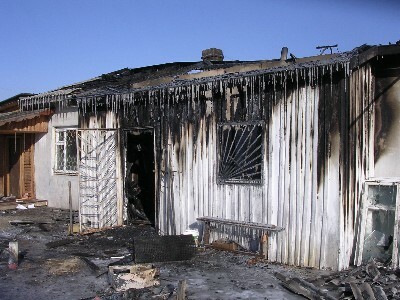 The Morely’s house on the day after the fire. remains outside the back bedroom. please send it to me, and I would be happy to forward it on to them. 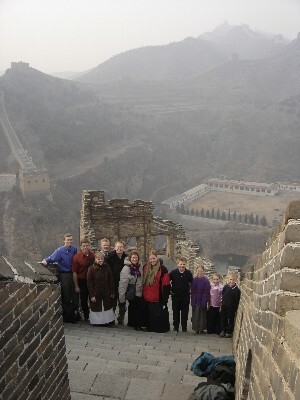 The pictures page for this update includes over a hundred photos, mostly from our visit to China. Here in Mongolia, cheese is fairly expensive, but one interesting detail is that all of the cheese is white in color. Even Cheddar and other cheese that would normally be yellow in America looks white, just like Mozzarella.